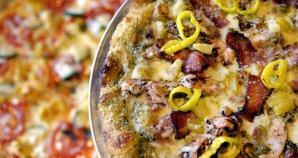 Mellow Mushroom Pizza Bakers in Herndon, Virginia, is conveniently located within the 267 Dulles Toll Road Corridor and just 22 miles from downtown Washington, DC. Vibrant colors, fresh baked pizza, ever-changing craft beer selections and local art that taps into the history of Herndon. Continuing Mellow Mushroom’s belief in tremendous creativity and avid respect for local history and community, the Herndon Mellow is indeed unique and pays tribute to Herndon’s rail history. Come join the Beer Club and enjoy a hand-tossed pizza on the open air terrace.